Last week I was on CNBC being interviewed by Dennis Kneale about Twitter and a few interesting things happened. 1-I learned that I can hold my own on live TV and look handsome doing it. 2-Dennis Kneale (the interviewee) really is caught up in the idea of New Media and Traditional Media. Before I get to far into this I should say that I don’t think Mr. Neale is a bad guy but rather just misinformed because some media folks would rather see new ways of doing things as a threat instead of embracing them and figuring out how to harness these new opportunities and really become the one that leads and owns everything new and cool that comes out. Now these are all generalizations and I am not poking my finger directly at Mr. Kneale but one thing that did surpise me was his comment that Twitter is taking away people’s passion to read and making people lazy. This was kinda funny to me since I wrote a “tounge in cheek” article for download squad about that exact topic and made the joke/observation that people will start communicating in 140 spurts and how it will be the downfall of communications. It am amazed that people actually think this way but it could have more to do with (and this is getting back to the first paragraph) the idea of New Media and Old/Traditional Media. The people that really excel in the media space or social media or whatever are the ones that realize that there is NO (notice the capitalization) such thing as New Media or Old Media. …and media is one way you get messages out to the masses (or targeted groups) and when you are trying to communicate a message you should send it out in as many ways as possible. In many ways I am OK with people not jumping into Social Media with both feet because as long as there is some mystery to it all I can sound like a know it all at parties and get invited onto CNBC (this was my second appearance) because that really impresses my parents but at the same time as more and more people catch up with the early adopters hopefully there will be opportunities for more interesting conversations on the matter instead of the type of mild attacks that happened in this interview….and I call this a mild attack because while I believe Mr. Kneale doesn’t understand Twitter or its value I also think he was just trying to make interesting television content. Finally, I considered disecting the intereview and offering up a color commentary of sorts of what I thought of it but think my co-worker Kelvin Kang did a pretty awesome wrap up of it all so instead I am just going to link to his post. Oh ya….and here is the interview in case you missed it! 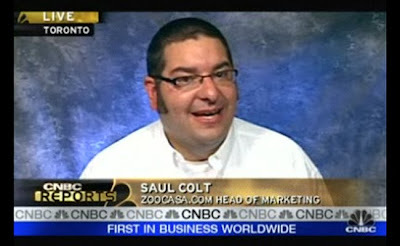 “Head of Marketing”? Does this mean you don’t do magic tricks anymore?